« VIP’s Updated Incident Report Form is Ready for Your Stories! 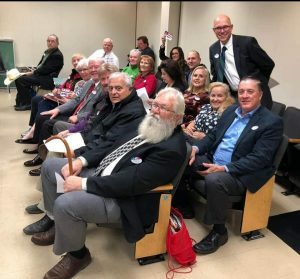 Nov 26, 2018, RALEIGH — The legislative battle for NC voter ID (2.0) began today with committee hearing over a draft law proposed last Wednesday by the Republican majority. We don’t love every bit of this law but understand the “taffy pull” involved in getting something better than a Virginia-style “fake-voter ID law” and even the more stringent Texas and Wisconsin versions. Reinforcements arrived later, but this was the core team that upheld the constitutional values during yesterday’s public comments. Circling from the left rear, they are Eric Dailey, Carol Wheeldon, Adelle “Dee” Park, Bill Demastus, Russ Alpin, S. Andrew Karras, Lamar Pender, Darryl Mitchell, Sherry Womack, Miriam Chu, Elizabeth Temple, Joanne Empie, Elaine Willers, Jerry Reinoehl, (unknown guy in far corner), Angela Humphries (holding up Voter ID sticker), Mark Peterson, Jay DeLancy (standing). H/t: Gerry Cohen for offering to take the picture! To be clear, all federally approved voter ID laws don’t amount to much more than window dressing. Even the best of them fall woefully short of preventing enough voter impersonation fraud. So, the bad news is that our law will easily fit into the mainstream of fraud-friendly federal voter ID laws (which the Left calls “strict”). The good news is abundant! First, NC’s upcoming voter ID law will easily survive federal judicial review. Second, the highly partisan NC Justice system will fail at derailing this law on constitutional grounds, now that voters approved the voter ID amendment to the state constitution. Third, our version of the law is still being drafted and debated; and with only take a small amount of tweaking North Carolina’s voter ID law can show other states how they can tighten up their laws in such a way that cuts out voter impersonation fraud “with surgical precision,” while not harming law-abiding voters. 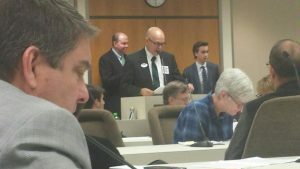 This is a long post, but it’s full of policy, and I’m holding back some of the rationales we submitted to the Legislature. If you want to see exactly what we gave to the committee, (typos and all) please click here. 163A-1145.1. (d) Exceptions. – The following exceptions are provided for a voter who does not produce a valid and current photograph identification as required in subsection (a): (1) Religious Objection. – If a voter does not produce a valid and current photograph identification due to a religious objection to being photographed, the voter may complete an affidavit under penalty of perjury at the voting place, provide, either by ink or by electronic scan, a print of the right forefinger, and affirm that the voter: (i) is the same individual who personally appears at the voting place; (ii) will cast the provisional ballot while voting in person; and (iii) has a religious objection to being photographed. Upon completion of the affidavit, the voter may cast a provisional ballot. (2) Reasonable Impediment. – If a voter does not produce a valid and current photograph identification because the voter suffers from a reasonable impediment that prevents the voter from obtaining photograph identification, the voter may complete an affidavit under the penalty of perjury at the polling place, provide, either by ink or by electronic scan, a print of the right forefinger, and affirm that the voter: (i) is the same individual who personally appears at the polling place; (ii) will cast the provisional ballot while voting in person; and (iii) suffers from a reasonable impediment that prevents the voter from obtaining photograph identification. The voter also shall list the impediment, unless otherwise prohibited by state or federal law. Upon completion of the affidavit, the voter may cast a provisional ballot. Rationale: How would you feel about your candidate losing by 100 votes and later learning that 1,000 voters managed to vote without producing a photo ID? A simple fingerprint would discourage any voter attempting to “game” the system to steal extra votes without disenfranchising the unicorns who truly lacked the proper ID. Explanation: The state already assists any voter who is unable to obtain a fully legal state-issued ID card. These bogus “voter ID cards” should only be viewed as a stopgap measure that also identifies people who need the help. 163A-869.1. (a) The county board of elections shall, in accordance with this section, issue without charge temporary voter photo identification cards upon request to registered voters who sign an affidavit, testifying to their inability to obtain an identification card issued by the Division of Motor Vehicles. Receipt of this card and the image of each recipient shall be public information that shall be retained in the voter registration file. The voter photo identification cards shall contain a photograph of the voter, a scanned print of the right forefinger, and the registration number for that voter. The voter photo identification card shall be used for voting purposes only, and shall expire at the end of the calendar year in which it was issued. eight years from the date of issuance. Rationale: Very few people actually lack the other types of ID required under law. SBOE Director Kim Strach testified that the original 254,391 voters listed without a DVM record translated to less than 2,000 actual persons who needed help getting an ID and only 620 were never found. These “free” ID cards are not needed by 99.9% of the population since they can ONLY be used for voting. Think about that for a second. They’re not reliable enough for conducting any other type of lawful transaction. Why is that? Because no birth certificates will be required to obtain one. In fact, it will only require a “HAVA ID” in order to get a photo ID in the name of that voter. Before you go storm the state Legislature on this point, realize that unelected Federal Judges are why this provision is in the law. It will, literally, take an act of Congress to unscrew this fraud-friendly clause in every state’s voter ID law. Explanation: The original loophole was never debated and nobody has ever explained how it got codified in the first place. We see it as sabotage from a Bill Drafter, but nobody will admit it. At any rate, this needs to go. NC Senator Jerry Tillman introduced a bill to kill it in the 2015 session, but court pressure forced leadership to table it. SECTION 1.5(b) The State Board is directed to create a list containing all registered voters of North Carolina who are otherwise qualified to vote but do not have a North Carolina drivers license or other form of identification containing a photograph issued by the Division of Motor Vehicles of the Department of Transportation, as of April September 1, 2019. Every month thereafter, an updated and current version of the list must be made available at no cost to the public. to any registered voter upon request. The State Board may charge a reasonable fee for the provision of the list in order to recover associated costs of producing the list. The Division of Motor Vehicles must provide the list of persons with a North Carolina drivers license or other form of identification containing a photograph issued by the Division of Motor Vehicles at no cost to the State Board. Rationale: This information should go on the SBOE FTP site, at no cost, and in the same manner that all other election-related data is currently made available to the public. Explanation: Under current law, a single poll worker can collude with a voter impersonator who presents an ID. Whether the voter is actually the stated person is in the hands of one poll worker, who may or may not be a partisan activist. With 2,700 precincts in NC, the best solution to that vulnerability is two-person (two-party) verification. 163A-1145.1. (b) Verification of Photo Identification. – After presentation of the required identification described in subsection (a) of this section, the precinct officials assigned to check registration and to issue ballots shall compare the photograph contained on the required identification with the person presenting to vote. The two precinct officials, not of the same political party, shall verify that the photograph is that of the person seeking to vote. If the any precinct official disputes that the photograph contained on the required identification is the person presenting to vote, a challenge shall be conducted in accordance with the procedures of G.S. 163A-914. Rationale: Current law only requires one person to verify the voter’s face matches their ID card, while denial currently requires triple verification. Any photo-voter ID law is greatly weakened if only one person is allowed to confirm a voter’s identity at the polls. This critical step should be a bipartisan, two-person process: once at check-in and once at the ballot station. In 2016, we already proved that some election workers were illegally disenfranchising certain voters in the 2016 primaries, so two-person acceptance is just as important as three-person denial of voters. Explanation: College students must have a valid state-issued ID card to take the SAT or ACT and at UNC, they even need it to be issued their college ID. Source: https://onecard.unc.edu/services/get-a-unc-one-card/. Allowing college ID cards to serve as a voter ID card is redundant. It also invites rampant fraud or abuse in a multitude of ways. 163A-1145.1. (a) (1) g. A student identification card issued by a constituent institution of the University of North Carolina in accordance with a process approved by the State Board that requires an application and proof of identity equivalent to the requirements for issuance of a special identification card by the Division of Motor Vehicles of the Department of Transportation. Rationale: Allowing voters to use student ID cards is dangerous because colleges and universities regularly issue student ID cards to people who are not US citizens. It is a felony for non-citizens to vote, so their voting may permanently jeopardize their path to citizenship. We do not need to make life harder for non-US citizens who are trying to follow the rules. Explanation: It is vital for election integrity and public confidence that anybody who votes in NC becomes a resident of the state. One of the key features to residency is their having a legal DMV-issued driver license or ID card. Candidates and parties need to know how many voters within their district do not have legal residency. This type of critical information cannot be hidden from the public if we are to rebuild public confidence in the democratic process.